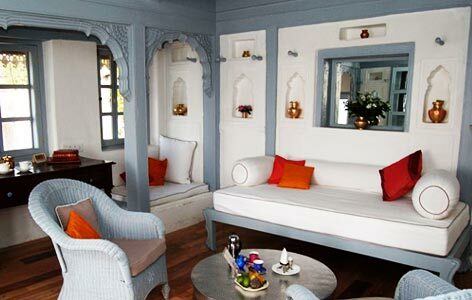 "Standing high on a hill, overlooking the river Narmada, Ahilya fort offers its guests a luxurious stay while offering excellent hospitality services. This heritage property is currently managed by Prince Shivaji Rao Holkar, son of the last ruler of Indore. Located in Maheshwar, Ahilya Fort is a magnificent structure that is around 250 years old. Overlooking the Narmada River, it is perched-up high on a hill and thus offers an amazing view of the ghats below. The fort includes ancient- style courtyards, verandahs and stone walkways. It was once the residence of Ahilya Bai Holkar, one of the most celebrated women rulers of India during the 18th century. It has now been converted into a heritage hotel. Ahilya fort Maheshwar, one of the most well-known heritage hotels in Madhya Pradesh, has a total of 13 rooms, tents and suites. They are sprinkled all around the 6 buildings of the fort. Every guest room is spacious, has period furniture, overhead fans and an antique décor. Some of the rooms and suites have private balconies. Have a comfortable stay in these rooms that have been air-cooled in a traditional way and perfumed by Khas-Khas while enjoying all kinds of modern facilities such as hot and cold water in the plush bathrooms, tea/coffee maker, mini refrigerator, safety locker, and much more. The royal tents also have a plunge pool and a private garden area. Each meal at Ahilya fort Maheshwar is an amazing experience. Enjoy a lazy breakfast mandap terrace (buffet) while enjoying the view of the surrounding. 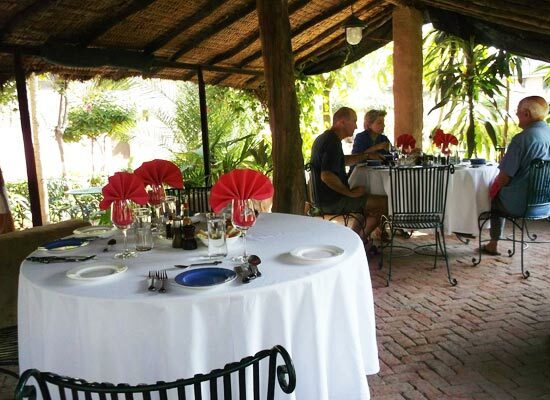 Have lunch at the leafy Badam courtyard. Savor your dinner by the well-lit pool or on an island in the river Narmada. The in-house chef prepares delicacies of Indian and continental cuisine with fresh ingredients, straight from the vegetable garden. Enjoy a wide variety dishes, snacks and beverages. There is also an in-house bakery churning out fresh breads, cakes and other items. Maheshwar in Madhya Pradesh lies on the banks of River Narmada and is considered the abode of Lord Shiva. There are a lot of temples of Lord Shiva in Maheshwar. Other places to see here are Rajgadi (royal throne) of Devi Ahilya Bai Holkar, state archaeological museum, Sahastradhara waterfall, cenotaphs and more.